Used in agriculture & horticulture such as Grapes, Citrus ,Pear, strawberry and Artichoke to improve fruit setting ,to loosen and elongate clusters and increase berry size in grape and to control fruit maturity. Esrel is a plant growth regulator , Ethylene Generator , used on apple, tomato .tobacco,sugar cane, wheat, cantaloupe, banana and etc. 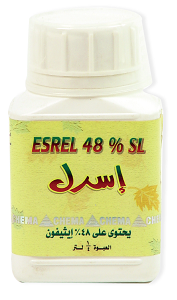 Esrel is used pre and post harvest on many fruits. Esrel is incompatible with alkaline materials and with solutions containing metal ions. 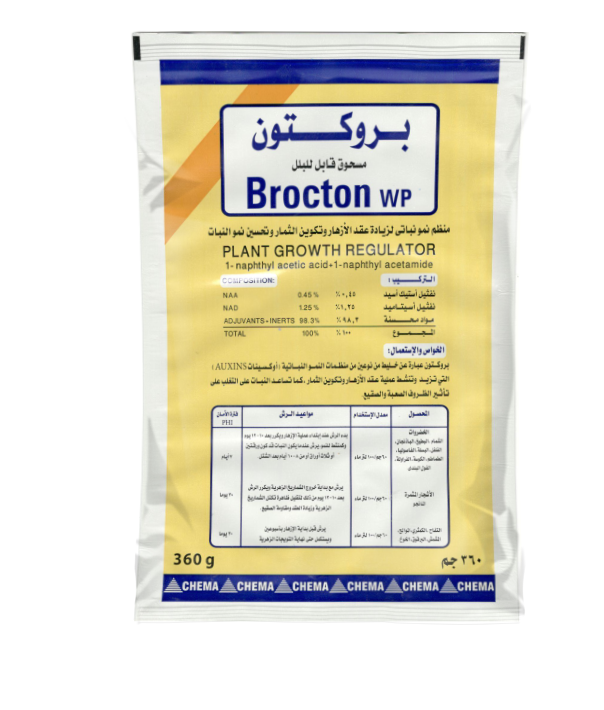 A Plant growth regulator, enhances pollination, for several crops: fruits, citrus, vegetables and Field crops. Harvesting the riches of the sea for benefit of mankind. A liquid fertilizer with high calcium, nitrogen, boron and amino acid contents. Aminogen is highly effective for Calcium deficiency resulting in an increased yield and quality. 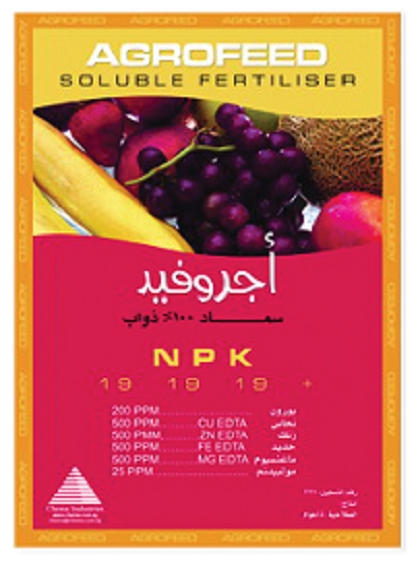 100% Water soluble NPK suitable for foliar or ground applications. Broxal is a clear N.B.K+T.E liquid Compound , contains macro & micro elements for general nutrition of the plant. Calboro corrects Calcium and Boron deficiency and enhances pollination. Calboro is absorbed by leaves and roots ,as the product is stable and contains Amino Acid. 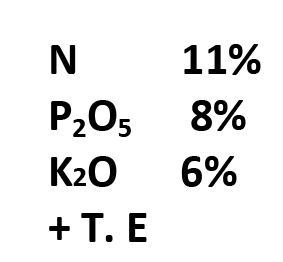 Boron takes part in different process as meristematic growth. Elodia is a natural nutrient and growth stimulant derived from sea weeds extract Ascophyllum nodosum, harvested from the eastern coast of Canada. Elodia also contains amino acids extracted by Enzymatic Hydrolysis, Gibberellins, Auxins, Cytokinins and NPK. 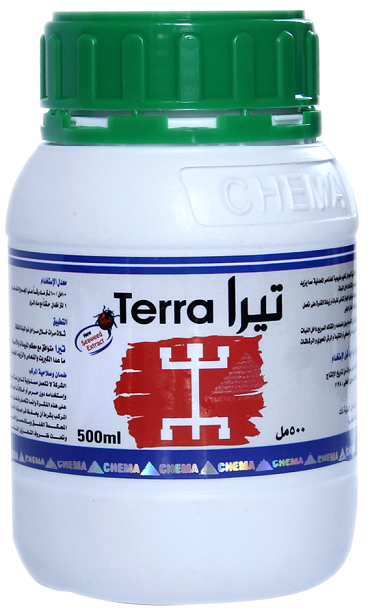 Terra is a natural biostimulant product derived by Enzymatic Hydrolysis. 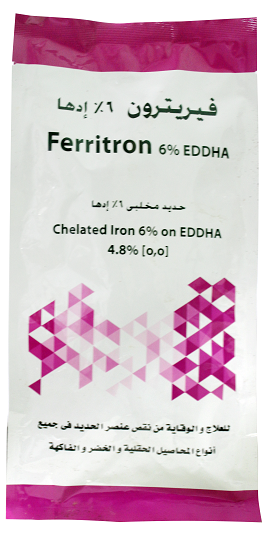 Terra is used in foliar and drip applications,giving the plant high resistance against frost, aridity , salinity and drought. Terra stimulates the physiological plant process. A biostimulant that energizes the biology of the soil and stimulates the production of beneficial bacteria and other organism beneficial of plant . Catalysst is an activator that facilitates the uptake of other ingredient. Catalysst is also a dynamic formula that can provide a cost effective foundation for all plants applications that need the benefits of bio stimulation. 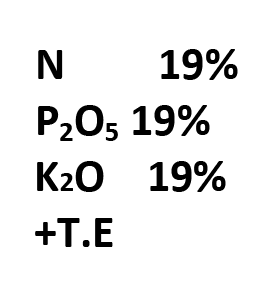 Potassium is a macro element required in a large amount for normal plant growth and development. Potassium plays an important role in controlling stomata movements and photosynthesis. 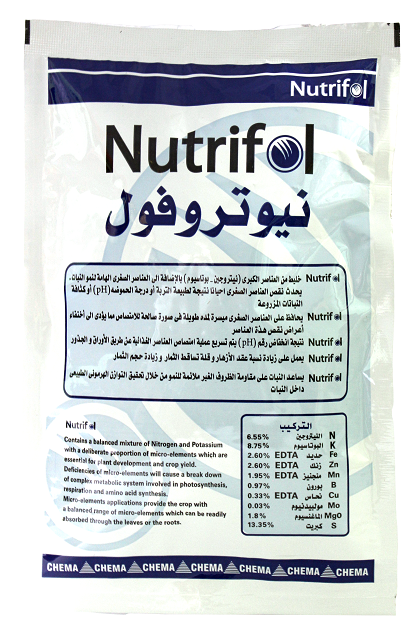 Nutrifol contains all needed micro elements in a well balanced formula. Available in powder or liquid suspension. Wetting & Sticking Agent for better spraying efficacy. Desal is a pH acidifier and salinity corrector for irrigation water to prevent the typical plugging of emitters or other parts in the irrigation systems, and it also acidifiers temporarily the soil solution , giving additional benefit to the core’s nutrition. Desal is most effective during the rapid vegetative growth Adding Desal to the foliar spraying , increases the effectiveness of fertilizer applied. 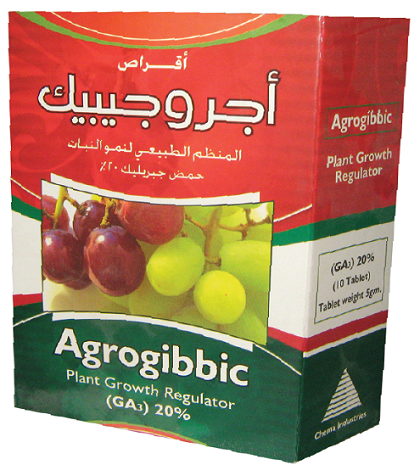 A specific fertilizer for special and intensive crops. 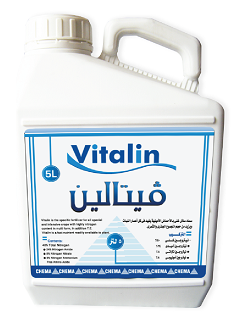 Vitalin has a high nitrogen and T.E contents Vitalin used in all stages of growth and safe at flowering stage .